I don’t know about you, but I get almost as much feel good mileage from travel planning as from the trip itself. A few years ago, a study from the Netherlands found that vacationers were generally happier than non-vacationers – not necessarily after a holiday, but before the holiday, while planning and anticipating their vacation. So I’ve been looking at travel trends, and dreaming and planning for our next trip. If you haven’t started planning your next vacation, here’s some travel inspiration for 2019 so you can take advantage of this pre-trip happiness. Although this is an oxymoron, a lot of people want to go where the other traveling masses haven’t settled in yet. For Canadians, Cuba has been a popular sun vacation for years, but we haven’t made it there yet. It’s great that more travelers can now safely visit formerly off-limits countries such as Cuba and Columbia. I’ve even seen Iran on some recent must-see lists. Through Instagram, I’ve seen how interesting and beautiful that country is, and I would love to visit, but today it’s still too difficult and dangerous for me. During my lifetime, the same would have been said about countries such as Vietnam and Cambodia, and today they are top tourist destinations, so maybe someday. Finding that undiscovered gem means different things to different people, but as people are traveling more than ever, you might have to go further to get “off the beaten path”. Getting closer to nature on a safari in African, elephant sanctuary in Thailand or tiger spotting in India are bucket list kind of adventures. Lately I’ve noticed more travelers are also visiting very remote Arctic or Antarctic locations, such as Greenland or South Georgia Island, where humans are outnumbered by polar bears or penguins. In case you don’t know about South Georgia Island (which I didn’t), it’s part of the Falkland Islands in the southern Atlantic Ocean. Visiting South Georgia Island is a bucket-list expedition that looks awesome but is pretty pricey. Maybe someday! For spectacular mountains, outdoor adventures and plenty of wildlife, I recommend Jasper, Alberta – and with the current low Canadian dollar it’s a bargain. For the best prices and to avoid crowds, try to travel outside peak times in July/August. 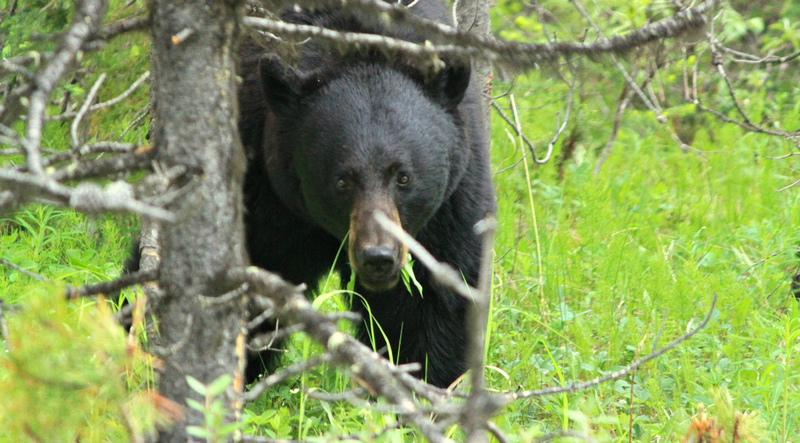 A black bear we spotted in Jasper National Park. Jasper National Park is also one of the world’s largest accessible Dark Sky Preserves, and one of the best places to view stars and northern lights. The Jasper Dark Sky Festival is held each October. And getting to Jasper…via the the Icefield Parkway from Banff is one of the world’s most unforgettable road trips. One of the best ways to put some distance between yourself and the traveling masses is by taking a road trip. A lot of travelers only take road trips locally, but internationally it’s a great option as well. Having a car gives you the freedom to stop at those interesting places not so accessible by public transport. If there are two or more of you, it can also be one of the least expensive ways of getting around. Stopping at a mosaic-embellished bench to take in the view of the white hill-town of Competa in Andalucia, Spain. A couple years ago we took a road trip through south and eastern Spain. Along our planned route were a lot of places we had not heard about, and it was wonderful having the freedom to stop and explore. We recently visited Stockholm, but a road trip might be a great way to see more of Sweden, as well as Denmark and Norway. These are relatively expensive countries, so we would have to figure out some ways to stretch our budget. One way of stretching your European vacation budget is to visit alternatives to the most popular destinations like Paris or Rome. Portugal is a great example, being one of Europe’s least expensive countries, but with great architecture, food and culture. Other options might be the Le Marche region of Italy, or Eastern European countries such as Hungary or Montenegro. While still popular with travelers, some of these options are less busy, and less expensive. Tokyo is a must-see if you are visiting Japan, but for something completely different, check out the mountainous northern island of Hokkaido. It’s a popular recommendation this year, as the Hokkaido Shinkansen high-speed train from Tokyo will begin service in March. Hokkaido is known for it’s wilderness areas with outdoor activities such as skiing or hiking, and Sapporo’s famous snow festival with enormous ice sculptures. Hokkaido is also a great food destination, with fresh seafood, dairy, produce and delicious local dishes such as soup curry. If you go to Hokkaido, be sure to visit Otaru, a picturesque small harbor city northwest of Sapporo. In addition to the rail link, it’s easy to fly from Tokyo Haneda to Sapporo with more than 80 flights per day. Food in Hokkaido | Light and delicious cheesecake in Sapporo, and fresh grilled shellfish in Otaru. MATERA, ITALY and PLOVDIV, BULGARIA | In 2019, Matera and Plovdiv are the European Capitals of Culture. ARLES, FRANCE The town famous for Vincent Van Gogh is getting a major new arts venue which features the Luma Arles tower by Frank Gehry. So if you haven’t planned your vacation yet it’s time to start dreaming! Where would you like to go in 2019? I confess I’ve developed an addiction to Korean Drama. For a long time I have enjoyed movies produced or set in foreign countries. I suppose it gives me a bit of a travel fix while I’m at home. So when my daughter moved to Seoul, she suggested I watch a Korean drama to see a bit of what her new city was like. I started watching “The Coffee Prince,” and soon I was hooked. The Korean Wave (also known as Hallyu) refers to the massive popularity of South Korean dramas (and Korean pop music/K-pop) since about 2000. This global wave has spread across Asia, into Latin America, the Middle East, Africa, Eastern Europe and to at least a couple of baby boomers I know in the Western world. Korean TV dramas are usually around 20 episodes, which allows time to develop the story and characters, but there is a conclusion in sight, unlike most North American TV dramas. There are a variety of genres, but the ones I’ve watched are romantic comedies. They reflect everyday Korean life in the same way Hollywood movies reflect life in the west, but still, for an outsider they do provide a glimpse into Korean society. I watch dramas on Viki.com, but there are other online options as well, and some are showing now on Netflix. The drama images below link to the official sites, but if you want to watch with English subtitles you will need to watch on a secondary site such as Netflix or Viki. If you enjoy romantic comedy and are looking for a fun escape with a touch of foreign culture, here are a few of my recommendations. Kim Joo Won (Hyun Bin), the handsome but arrogant CEO of a luxury department store doesn’t care about romance; he’s looking for a marriage that will increase his power and connections. Gil Ra-im (Ha Ji Won) is not a beautiful heiress, but a stuntwoman dedicated to her craft. She’s not impressed by Kim Joo Won’s money or position, and thinks he’s a pest. After a strange sequence of events, they find they have switched bodies leading to a complicated relationship. Part of this drama takes place on Jeju Island, which we visited when we were in Korea, so it was fun to see those places in the drama. “My Love from Another Star” is a fantasy romance about an alien, Do Min Joon (Kim Soo Hyun) who landed on Earth in the Joseon Dynasty. His superpowers and 400 years of earthly experience lead him to feel superior over humans, until he falls in love with a top actress in the modern era, Cheon Song Yi (Gianna Jun). As a recent example of cultural impact, when Cheon Song Yi ordered chicken and beer on an episode of “My Love From Another Star,” Korean beer exports rose by over 200 percent. If you’re looking for something fun and foreign to watch, I recommend giving one of these dramas a try. Have you watched any Korean dramas? An interview with Nancy of WalkSit.com. Nancy felt pretty unfit, and wondered if she could I actually walk nearly one thousand kilometres at the age of 56. Her Camino de Santiago dream began 40 years ago, but like many of us, life got in the way. She recently decided to wait no longer, bought her ticket to Spain and completed her first Camino! Nancy’s story caught my attention as completing a long-distance walk like the Camino is a goal of mine too, and I could relate to her age/fitness concerns. I’m delighted Nancy agreed to answer a few questions about her journey. Q: What made you take the plunge and fulfill your 40-year dream? Nancy: I’d gone through a bad workplace experience at the beginning of the year that sort of topped off an arduous 12 months the year before. So I decided to “retire” as I’d reached my Super’s preservation age [in Australia, early retirement – Ed.] and access most of my Super to renovate my house, take a sabbatical to recoup, and to fulfil my dream. Until I’d bought the ticket ($3K) I didn’t actually believe I was going to walk the Camino after all these years. Q: Why did you choose the Via de la Plata Camino route (Seville to Santiago de Compostela) instead of the more popular Way of St. James route? Nancy before the Camino, at the airport in Australia. Nancy: My answer probably says more about me than anything else. OK – since I’d taken the plunge and accessed my Super, I thought I’ll do this Camino thing, then I thought I can’t be bothered with crowds of people (the Camino Frances is very populated) and I certainly didn’t want to be competing for beds every day SO I picked one of the hardest and least travelled routes. The Granada route sounded too hard (see Sinning Across Spain by Ms Piper) so the Via de la Plata was my first choice. Veteran pilgrims I met along the way said they’d rarely heard of any newbie tackling the Via de la Plata as their first Camino. But my attitude was just to do it – I didn’t know what to expect really so I went in naïve and ready for anything. Q: Did you do a lot of physical preparation for the walk? Nancy: I thought I was “heroic” walking 8 kilometres every few days for about 4 weeks! Ha! When it came to practising with a loaded rucksack, as they suggest you do, I put that off for weeks as I didn’t want to find out that my back with its severe arthritis couldn’t manage it. Talk about avoidance and procrastination! Q: Along the way, were your biggest challenges mental or physical? What did you learn about your body’s physical abilities? Nancy: My biggest challenges, as a new pilgrim, included not being too clingy and dependent on more experienced peregrinos. I spent a lot of my first 2 weeks strongly doubting my own capabilities to get out of the village and manage the distance and get into the next village and find accommodation. Once I figured out that I could do that, I stopped having expectations of other pilgrims. That eased the mental load. Physically, the distances took their toll on the soles of my feet more than anything. I managed to inflict blisters on myself through stubbornness, but once they cleared up I was fine. Plus your pain threshold rises so you get to a place where you can cope with whatever your body is screaming and just keep walking. You know that you will get there in one piece! What I learned about our ageing bodies is that we are actually designed to be work-horses. We/I spend so much time being sedentary it’s no wonder we are prone to disease and decay. We are meant to be out using our bodies to their optimum level each day. Mine thrived on walking 15 to 20 ks a day! And I learned that we don’t need all the food we eat in our sedentary lives. I was one of the youngest ones out there at age 56! The oldest I met was 86 and someone met another person aged 94. Q: Gear – Is there any must-have item that made your walk easier or more enjoyable. Are there any items you wished you brought? Towards the end of the Camino, Nancy is looking strong and energized. Nancy: I positively couldn’t have managed the walk without my walking sticks. I picked up a pair in the local sport shop and had never used sticks before. In fact I’d never walked more than maybe 10 ks in my whole life before! Walking sticks kept me balanced on muddy ground, through longish grass, on bitumen, up hills and mountains, down as well, through all sorts of terrain. They were a support and became my friends. You hear the pilgrims tap tapping out of any village from around 6am onwards on the cobbled roads. I wish that I had not thrown out my Tiger Balm! And I strongly recommend buying a pair or two of those little shoe skirts that you can get in supermarkets – tradies buy them to keep dirt or sparks etc out of their shoes. Gravel and sand etc on the Camino can do your head in. Shaking out your boots on the Way involves finding somewhere to sit, unloading your rucksack, undoing your laces, etc etc. Those little shoe skirts would have been wonderful. I would take a pair next time. Q: Food is usually a big part of travel. Was that still true on the Camino? Did you pack food for along the way or eat at restaurants? Nancy: I was looking forward to what I thought was Spanish food – tortilla, chilli con carne, very spicy food, as I love heat, spice and more spice. But Spanish food in rural Spain is quite plain – after all they are farmers and crop growers. So the food was quite mundane but still very delicious. I did get sick of Menu del Dia but then I ate around 60 of them – grilled meat of some sort and chips. A few times early on, I made up a big sandwich for the road – as I thought I might be starving to death with all this walking. But eventually, a couple of pieces of fruit were more than adequate for the walk with a light brekkie to start with and as much as you can eat that night in the next town. Q: While traveling I’m much more active, and love the feeling of getting stronger. But somehow when I get home it’s too easy to slip into old habits. Have the Camino habits carried over into your post-Camino world? Nancy arriving at the Cathedral of Santiago – triumphant! Nancy: Funny you should ask that as just today I wrote a post about having become a couch potato. For the first couple of weeks since I got back, in October last year, I righteously walked every couple of days. I didn’t want to lose all my excellent muscle definition and tone and feelings of being in top condition. But then the extreme summer heat AND the Christmas season struck so I spent a lot of time indoors. Even now, nearing the end of March, I’m still sedentary. When you’re out on the Camino, that’s like your job. That’s what you do each day – walk walk walk. There are no pressing issues of real life stressing you out and life is clean and simple and basic. Uncomplicated. Back home, it’s quite different. Same old streets, more of a chore, whatever. But I’m happy to think that it’s a stage I’m going through and that with the onset of our southern hemisphere winter, I will get back out into walking mode. I believe walking is the best thing because it’s not stressful like jogging on our ageing bodies and it’s free and scenic and flexible. Q: Any advice for fellow boomers considering this challenge? Nancy: My biggest realisation is that ageing is made out to be a disease. A complete negative. The media and the culture we occupy are complicit in this. I learnt that we are ageing, yes, but we are strong and vital. No need to think about the nursing home at all ever! If some 94 year old pilgrim is out there walking the Via de la Plata then that says a lot more than I could ever write about how we are capable of a lot more than this culture/society gives us credit for. My advice? Just do it! If it’s still nagging at you, then that’s a glorious part inside you that is telling you a dream is about to unfold. Make it come true! Nancy is on a mission to show that we are all more capable of achieving our dreams than we think we are. Please check out her website Walk Sit for walking resources and stories about her Camino journey, and keep up to date with her on Twitter at @walkingsitting or Facebook at walksitcarrywater. Photos are courtesy of Walksit.com. “Wild” has been made into a movie, starring Reese Witherspoon, now playing in theaters. Okay, okay, I will probably only experience this hike in my dreams. But Cheryl’s story of physical endurance and self-discovery is all the more inspiring to me because she was a relatively inexperienced hiker, but determined to reach her goal. For the rest of us… hiking is an adventure you can scale to your ability and timetable, and is usually free. Public walking trails are available around the world, and they often get you out of the tourist crush and lead you to wonderful natural places you couldn’t access by car. Here are eight great walks for inspiration – some we’ve experienced and others are on our list. The Pacific Crest Trail runs from Mexico to Canada, along the peaks of the Sierra Nevada and the Cascade Mountain ranges. Cheryl Strayed hiked 1,100 miles, and a few determined hikers complete the whole trail. But like many epic hikes, there are points you can experience parts of the trail as a day-hike. The section that includes Crater Lake National Park sounds really interesting to me. When to go: summer, as the trail can be snow-covered much of the year. A hike to the Tea House from Lake Louise is one of many that can be done as a day trip from our home in Calgary, Alberta. This forested hike up a mountain rewards you with spectacular views of Lake Louise, two more lakes and a waterfall. At the top of the hike, next to Lake Agnes and under the Beehive peaks, is the very popular Lake Agnes Tea House. It has been serving tea since 1905, and is a great spot to relax before the hike back down, or continuing your hike further. Check here for more info. This path follows Hadrian’s Wall, which the Roman emperor Hadrian ordered constructed across the width of England in AD 122. Today, most of the wall still exists, and it can be walked coast to coast, while enjoying spectacular views across the countryside. Highlights along the way include Roman forts, bridges, wildlife, pubs, cafés, and market towns. This is one I want to try! Distance: 84 miles coast to coast (135 Km) There are also shorter circular walks based on the Trail. Difficulty: Relatively easy but with rough and uneven ground. Some of it is steep, and there are a lot of stone and timber steps. It is recommended to book accommodation along the trail in advance. Baggage services are available along the Trail. Check the The National Trails website for more information on the Hadrian’s Wall Path. The Great Wall was constructed to protect the vast Chinese empire and its vast lands, and is one of the world’s greatest feats of engineering. It was constructed and rebuilt over the centuries, but a majority of the existing wall is from the Ming Dynasty. Climbing the wall’s path up steep steps and down valleys is a bucket list experience, and you can choose from a range of areas to climb that suit your interest and ability. We chose the Mutianyu section, which is good for a day trip from Beijing, but much less crowded and touristy than the nearer Badaling section. The day we went was cool and misty, and we almost had the wall to ourselves. Eventually the sun broke through and the views were spectacular. We spent a couple hours at Mutianyu hiking and taking in the scenery. If you want a bit longer hike there is the Jinshanling to Simatai route, which is about 10.5 kilometers. Difficulty: Moderate. Some of it is steep and there are a lot of stairs. Some of the less-visited sections are in ruins or missing, so are more challenging. The Badaling and Mutianyu sections are well maintained. 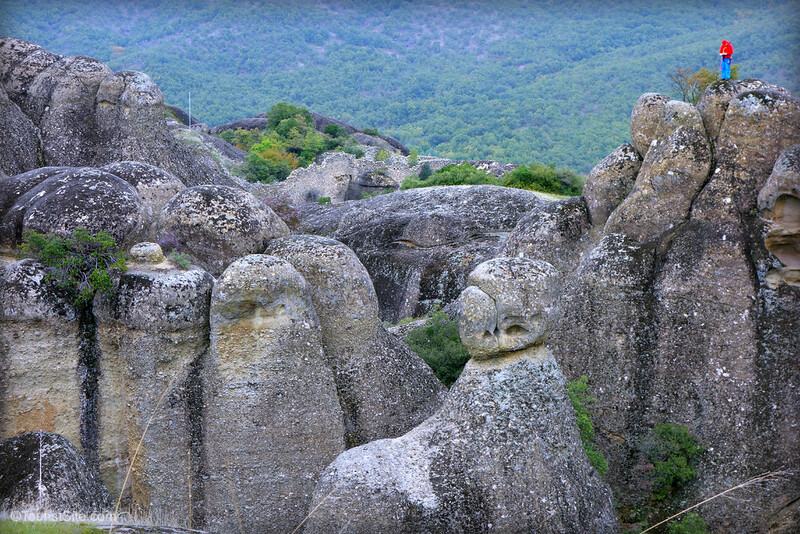 A hike in Meteora includes amazing sights both natural and man-made. About four hours northwest of Athens is Meteora, where unique geological peaks form a dramatic and beautiful natural landscape. Upon these seemingly inaccessible peaks, monks in the 11th century began building monasteries. Eventually twenty-four of these amazing monasteries were built. Ancient paths weave throughout the area, and guided or independent hikes are possible. We were so glad we had the opportunity to visit this magical and off-the-beaten-track part of Greece. Difficulty: There are options rated relatively easy to expert. The trails are generally not sign-posted, so only experienced hikers should venture out on their own. To experience Meteora as we did, I would recommend contacting the friendly Visit Meteora office in Kalampaka. Visit Meteora offers guided tours and hikes, but will also assist you with maps and information if you wish to hike independently. 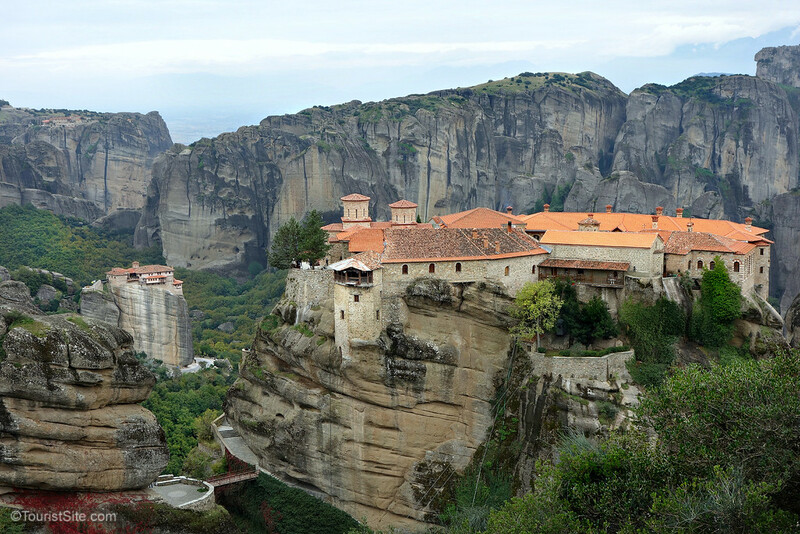 For more about our Meteora visit click here. Our excellent hiking adventure in Meteora was facilitated by Visit Meteora. All opinions are our own. A hiker consulting his map in Meteora. Bryce Canyon is another geological wonder with spectacular colors and hoodoos. There are countless walking trails through the canyon, including the day-long Fairyland Loop, Wall Street trail, which laces its way through an alarmingly narrow gorge, and Navajo/Queens Garden Loop. Bryce Canyon is on my list to visit soon. The trails are well laid out and maintained. Spend a day or a week. Camping and lodging facilities are available. To plan your trip check the National Parks Service website. The Yoshida Trail starts at the Fuji-Subaru Line 5th Station and leads to the summit from the north side of Mt. Fuji in Yamanashi Prefecture. There are mountain huts and pitstops en route, to rest your feet and bed down for the night. Mount Fuji is apparently the most climbed mountain in the world, so is more of a community experience, than an alone-with-nature one. Viewing the sunrise from the summit is said to be unforgettable. When to go: early July to early September, perhaps avoiding the busiest week (Obon Week) in mid-August. 170,947 people climbed the Yoshida Trail in summer 2014. It is recommended that climbers stay at mountain huts one night on the way to the summit to adjust to the altitude and temperature. For more information about climbing Mount Fuji click here. The epic Camino de Santiago is really any pilgrimage route that leads to the Cathedral of Satiago de Composela in Galicia, Spain. The most famous is the 500-mile route from St. Jean-Pied-du-Port, France. But there are many others including the Portuguese Way, which begins in either Lisbon or Porto in the north of Portugal. Some go for a religious experience, but people do the walk for many reasons. I would love to try even a portion of this hike some day. When to go: spring and fall are recommended to avoid the heat of summer, and the cold and snow of winter. Most hikers carry a pilgrim’s passport, or credencial, which is stamped with the official St. James stamp along the way. Pilgrims hostels are available along the route. Martin Sheen starred in an inspiring movie, “The Way”, about a father’s journey on the Camino de Santiago. The Way was produced and written by his son, Emilio Estevez. For more about the Camino de Santiago click here. “Go forth on your path, as it exists only through your walking.” ~ Saint Augustine (354-430). Have you experienced an epic hike? https://touristsite.com/wp-content/uploads/2014/04/wildpic.jpg 577 900 Shelley http://touristsite.com/wp-content/uploads/2014/03/touristsitelogobig-300x117.png Shelley2015-02-01 16:00:182019-01-09 20:20:03Eight Walks in the "Wild"
A big thank you to Drea from Travels With Drea for nominating me for a Liebster Award! You can explore her fantastic blog right here. It is both an honor to be recognized and great chance to promote some fellow bloggers. What is a Liebster Award? The Liebster is an award given to bloggers by bloggers. It’s an opportunity for new bloggers to introduce themselves and highlight their work by answering a few questions. They pay it forward by recognizing 10 others, and creating 10 questions for them to answer. 1. Why did you start your travel blog? I had to start this blog, as I have been a travel addict for some time now and needed an outlet! I hope sharing our experiences will be inspirational and provide useful tips to our readers. 2. If you could go to any place in the world, where would that be and why? Besides everywhere, the first place that comes to mind is Africa, to go on a safari. Other than a short trip to Morocco, we haven’t been to Africa, and photos and stories of other travelers experiences there are so amazing. 3. What are your top 3 must have items when traveling? iPhone, my Macbook Air, and lip balm. 4. What was your favourite place that you have visited? Monterchi, a beautiful little hill town on the Tuscany/Umbria border. It was our first time in the region, and we were there with my parents and my brother and his wife. We rented a villa at the top of the hill which was built from the ruins of a former castle. At the end of each warm, busy day of exploring, we returned to the villa and cooled off in our fantastic pool with a stunning view of the countryside. 5. If money was not a factor, what would be your dream job? Probably what I’m doing now, working as a graphic designer and travel blogger, except I would be delighted that money was not a factor! We enjoy what we do and much of the year we are able to work remotely. Have laptop, will travel! 6. If you could live anywhere in the world, where would that be? I would like to “test drive” living in a variety of places. In Canada, if our home base wasn’t Calgary then I would like to try Victoria, British Columbia. Southern Spain I love for the weather and Spanish culture, and New York City or Paris for big city life. 7. Who is your favourite travel blogger? The first travel blogger I came across and who has inspired me is Chris Guillebeau. Even though we have been traveling for years, travel bloggers weren’t really on my radar until I came across his website. His stories of his RTW travels and travel-hacking strategies really opened my eyes to the possibilities. Now there are many I enjoy, including The Planet D who are fellow Canadians, The Gypsynesters because I can relate closely to their stage of life and I love their sense of humor, and many other fellow Boomer Bloggers. 8. What is one piece of advice you would give to someone who has never traveled before? Stop dreaming and do it! If you really want to travel, it’s within reach of most people if you make a plan and prioritize. Life is short and the world is such an awesome place. 9. What do you do to overcome writer’s block? I work better under pressure, so a deadline helps. Writers block isn’t so much a problem for me, as is getting easily distracted by other things, such as social media or reading other peoples blogs. I’m a list-maker, so when I have a post idea I add it to a list, and I have lots of options if I’m ever stuck. Tell us something surprising about yourself. What’s your favorite travel tip? What’s the most memorable food you’ve tried on your travels? Where is your favorite off-the-beaten path location? Has a movie or book ever inspired you to travel? Have your travels taken you outside your comfort zone? Is your travel style luxury or budget? If you weren’t blogging about travel, what would you blog about? When you have answered the questions, please share the link from your blog in the comment section below. Thanks for participating and share the love! “Who will look after my dog?” is a common dilemma when going on vacation. Our solution was to bring our Yorkshire Terrier, Winston, along with us for a six week trip to Spain. Winston has travelled with us on several road trips in western Canada and the US, but we have never taken a pet on a transAtlantic flight. If we were taking a shorter trip or one with multiple stops, we wouldn’t take our dog as it wouldn’t be worth the expense, red tape, or the stress on our dog. The experience turned out to be a great one for us as well as Winston. Our stay was long enough to make the effort and expense worthwhile. Winston is small enough to fly in the cabin with us. We were planning to stay at one location, rather than moving a lot from place to place as we have on other trips. There is no quarantine period for pets entering the EU from Canada. Click here for more details on this trip and how you can travel with your pet. Follow TouristSite’s board Winston’s Big Adventure on Pinterest. Rocky Braat is a young American man who found his calling while traveling through India, after helping out at an orphanage for children with HIV. After spending a few days with them, he found that he couldn’t leave them and so he returned to America, sold everything he owned and went back to help care of the children who thought of him as a big brother. “Blood Brother” is the Sundance award-winning documentary about Rocky, and was one of the most moving films I have ever seen. Some of it is hard to watch, and it won’t leave many eyes dry. But it is also so inspiring and I found myself thinking about it long after. Many of us see the hardships of others on our travels, or in the media, and feel empathy… wish we could do something… maybe even send a donation. Rocky is doing something. He was so touched by the children’s joy and love in spite of their hardships, that he packed up his life in America to live with them at the orphanage and become a family. Steve Hoover is Rocky’s best friend and filmmaker. In an effort to find out what motivated his friend’s drastic action, Hoover decided to film Rocky’s as he left his home in Pittsburg to return to the orphanage in India. Part of the film’s impact is the honesty and vulnerability of how Rocky’s is portrayed. He is not a saint, but a real person who is living with the joy, sadness and frustration that comes with caring for his new family of children at the orphanage. These kids are dealing with serious health problems as well as abandonment and rejection by their families. “Rocky Anna,” which means “Brother Rocky” in Tamil, serves as their teacher, doctor, dentist, father, and friend. See the “Blood Brother” film trailer. “Blood Brother” is available on iTunes and Amazon. All of the filmmaker profits are going to Rocky and the kids and other HIV efforts. If you would like more information about Rocky and the orphanage, or would like to make a donation, see their website www.givethemlight.org. Sign up to receive TouristSite’s monthly update. No spam ever.